In 1856, a huge fire took place at Haymarket Square. The fire consumed the Gerrish Market building, second-largest market structure in Boston with Quincy Market being the largest. The market was constructed of brick, and was six stories in height. The lower stories were used as a domestic market, and the upper stories were used for the manufacture of books, furniture, pianos, and sewing machines. The brick walls collapsed during the fire and crushed two adjoining wooden buildings. "April 12th 1856, a few minutes before one o’clock, a dense black volume of smoke was seen rolling up in the direction of the north part of the city, and in a short time the deep toned bells in connection with the signal boxes, proclaimed its locality to be in the vicinity of Haymarket Square. The fire proved to be in a large building on Sudbury Street, known as the Gerrish Market, which was six stories high, and extended from Portland Street to Friend Street. The fire [started] in the attic, and as a high wind was prevailing at the time, it spread through the entire length of the building, with fearful rapidity, and as the ladders used in the department were not of sufficient length to reach the roof, the fire was allowed to work its way down to the fourth story, before a stream of water could be thrown upon it with any force. For nearly an hour the flames were unchecked in their progress from room to room, and when the fire had penetrated down into the fourth story, the scene was truly terrific. The upper portions of the walls were entirely hid from view by the immense body of flame which filled up the market building, and the buildings on the streets. At this time the news of the conflagration had been carried to the neighboring towns, the firemen with their engines, and the citizens came pouring into the city by thousands. The large square with all the avenues leading from it, were densely thronged by the living mass, who were viewing one of the most grand spectacles ever witnessed in the city. By the aid of ladders the firemen were now able to throw a few streams of water into the third story, but no hindrance was given to the gathering force of the devouring element, which had now undisputed sway, and all the efforts of the firemen to save the building were ineffectual, and their attention was drawn to the preservation of the surrounding property. At three o’clock the walls of the market building commenced falling, and, as piece after piece came thundering to the ground, the forked flames burst anew. The noise of the falling walls was tremendous, and the danger to the firemen and spectators was great, still they ceased not in their labors, but continued on amid the surrounding dangers. 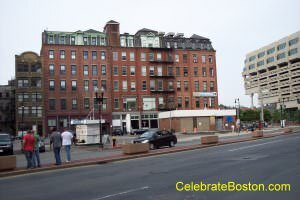 That part of Haymarket Square next to Sudbury Street, was a complete bed of coals and cinders, the heat of which caused the gas of a cesspool to explode thereby badly injuring three men. About 4 o’clock, the steam fire engine Miles Greenwood, was brought upon the ground, and played two streams upon the ruin, being the first time a steam fire engine was practically used in Boston. By this fire a large number of persons were thrown out of employment; loss $250,000."